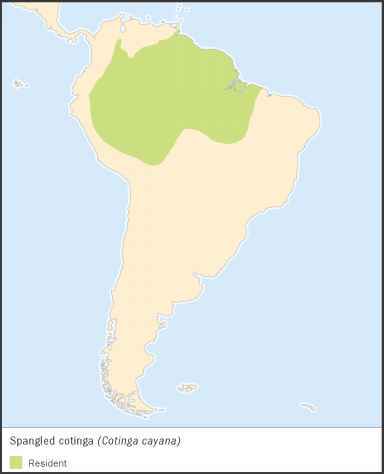 The kinglet calyptura, also called the kinglet cotinga, is Critically Endangered, facing an extremely high risk of extinction in the wild. It lives in only one place in Brazil and its population is tiny. 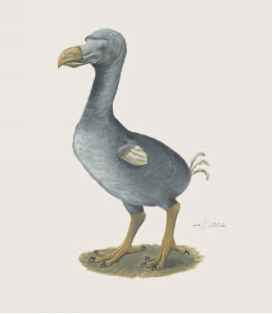 This bird had not been seen in over one hundred years and was thought to be extinct until it was re-discovered in 1996. Four other species of Brazilian cotinga, the white-winged cotinga, the yellow-billed cotinga, the banded cotinga, and the buff-throated purpletuft are all Endangered, facing a very high risk of extinction in the wild. Ten other species are considered Vulnerable, facing a high risk of extinction. The population of these birds is declining rapidly because their habitat is being destroyed, and their small populations are being fragmented, separated. Cotingas have some of the loudest voices in the bird world. The calfbird, also called the capuchinbird, gives a cry that sounds like the mooing of a young cow. It uses special air sacs to amplify the sound and make carry over a longer distance.